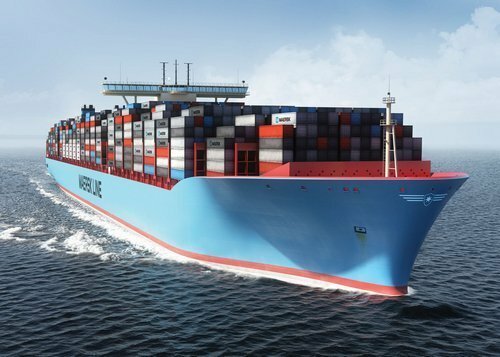 About a year ago, euphoria swept the marine shipping world, as the Maersk EEE started making regular voyages and caused us to rethink the economics of shipping. The 18,270 teu vessel is awe inspiring and the sheer economy of scale it provides makes it possible to start considering a revolution similar to one that took place in passenger aviation following the introduction of the Airbus A380. A few companies have followed suit with mega-vessels of their own, and by the end of 2014, the 19,000 TEU vessel will allow CSCL to crown themselves as having ‘the biggest one’. And sometime in 2015, a few similarly-sized newbuilds will add to the global capacity. Will the mega-ships change the world of shipping or will they merely become floating monuments of engineering prowess? There is no disputing the fact, that the slot cost economics of mega-ships favor them over smaller vessels, even if utilized at capacity below 100%. But let’s review some factors influencing global container shipping to assess the short and mid-term viability of the mega-ship strategy. Demand is a key factor. Under one scenario, the demand in the traditional destination markets will rapidly recover over the next 12-24 months. The trade picture emerging over the last 12 months does not support this scenario. The demand of traditional markets is recovering at relatively slow pace, which is seen in both, the level of activities at traditional destination ports and the manufacturing output reported by Asian companies. The pace of demand recovery may mean that just as the existing mega-ships get assured of 100% utilization, the new mega-ships entering the service in 2015 will increase the available capacity and throw the demand-supply balance into disarray. However, if you still believe in this ‘rapid recovery’ scenario, consider another powerful trend happening now – re-shoring of manufacturing capacity from Asia closer to the North American and European markets. This relocation process, currently underway, means that the re-shorers gain major advantage of reduced length and cost of their supply chain over their competitors remaining in Asia. Counteracting this trend, Asian manufacturers are responding in three ways, each impacting the mega-ship strategy. Some follow the re-shorers and set up new capacity where means of production still offer them cost advantage (e.g. Turkey for Europe and Mexico for North America). Some lean harder on the shipping companies to reduce the shipping costs and they are getting their wish, as the mega-ship owners need cargo to maintain 90%+ utilization on every voyage. Last but not least, they aggressively look for new demand in new markets, especially in Asia and Africa, as evidenced by the increasing trade flows already trending higher than 2013 volumes. These flows are obviously much smaller comparing to Asia-Europe and Asia-North America flows, but they generate container demand on both ends, creating steady demand sufficient to fill vessels below, but not above the 14,000 teu mark. If these three trends are not enough to put pressure on the current owners of mega-ships, then arrival of comparable vessels in 2015 will surely lead to renewed price and margin pressures. Carriers can respond by improving economics of their rotations, continuously optimizing their network, and being smarter about forecasting and demand planning. They have access to information technologies that can help them with these tasks. Bundling of services and increasing integration within far-reaching alliances are other countermeasures taken straight out of the book of airline alliances. However, operating within an alliance framework carries the risk of de-optimizing each carrier’s operations to meet their obligations to the alliance. For the keen observer of the shipping market, 2014 will bring some, but not all the answers to the mega-ship strategy. Just as the aviation industry is seeing the Airbus A380 story unfolding differently from earlier projections, we may not yet be seeing the full picture of the impact of the mega-ship strategy on the marine shipping industry. Kris Kosmala is the director of smart port operations and digital services for Royal HaskoningDHV.